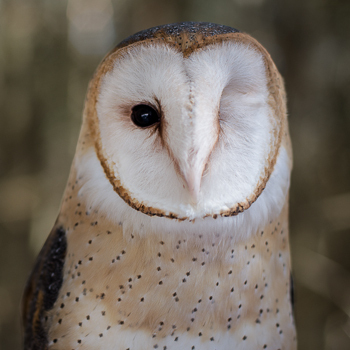 Jackie arrived as a downy chick in July 2008 with an eye injury that was discovered while her nest was being banded by an ODNR nest monitor in Tuscarawas County. It is believed that she was taloned by a nest mate when she was just six weeks old. Because the injury had become infected, it was recommended that Jackie’s eye was removed and she became a permanent resident of the Medina Raptor Center. She currently thoroughly enjoys being an educational ambassador and going on programs to show off how beautiful she is. The Barn Owl is one of the most widely distributed birds in the world, found on all continents except Antarctica, and on many oceanic islands as well. It has been introduced by people to some of the few places it did not already occur, namely Hawaii, the Seychelles Islands, and Lord Howe Island. White or mostly white underside. Back tawny, marked with black and white spots. Round head without ear tufts. Sexes similar in plumage, but females are larger, darker, and more spotted below. Resident from northern United States and southern British Columbia southward through Central and South America and the Caribbean. Also Africa, Europe, southeast Asia, Australia, and some oceanic islands. Introduced to Hawaii, Seychelles Islands, and Lord Howe Island. Found in open habitats, such as grasslands, deserts, marshes, and agricultural fields. Nests in hollow trees, cliff cavities, in buildings, and nest boxes. Nest cup made from shredded owl pellets. Common, but local in some parts of its range. Populations in Midwest and inland East dropped dramatically during 1970-2000. Listed as Endangered in some states. Nest box programs have helped increase populations in some areas.